Strawberry season is fast approaching, and I’ve been researching some of the nutritional benefits of these sun-ripened, sweet berries. The bright red color of strawberries indicates a high level of anthocyanins, or color pigments, with hues ranging from crimson and magenta to violet and indigo. These red hues help to ward off heart disease by thinning the blood and slowing the oxidation of “bad” cholesterol. Research also indicates that strawberries are an anti-cancer powerhouse, protecting the body against lung, oral, breast and cervical cancers. Eating strawberries is good for your teeth, as they fight the bacteria in your mouth that contribute to tooth decay and gum disease. I like to think of strawberries as a both a treat and a health food. A one-cup serving of strawberries provides over 140% of the recommended daily allowance of Vitamin C, and is a good source of folate, potassium, iron and calcium. Plus, strawberries are rich in fiber, and help to quell sugar spikes in the bloodstream. Nothing beats the taste of a freshly picked, Maine strawberry. 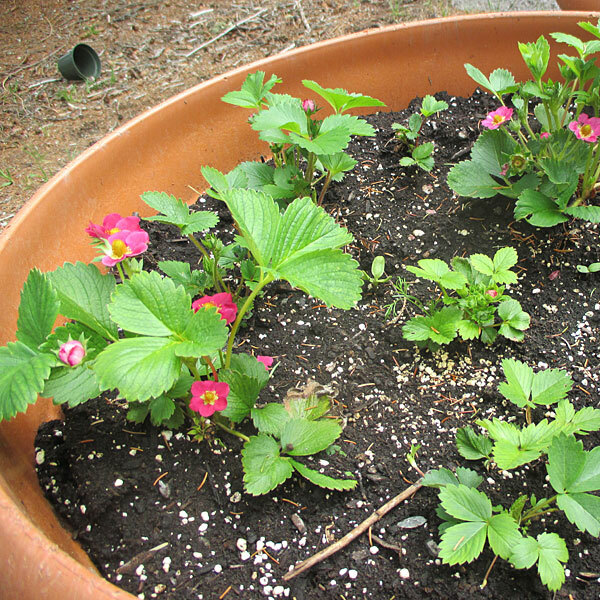 This year, I’m growing a day neutral variety called Tarpan, in 2 large containers. Almost an ornamental, these plants have beautiful, deep rose colored blossoms and produce berries almost all summer. They are prefect to pick for breakfast, or make a delicious salad. The inspiration for the recipe for Summer Strawberry & Feta Salad comes from Eating Well magazine. I love the strawberries in both the dressing and the salad, and the taste contrast of fruit with cheese. Of course, this recipe is easily adapted to additions like salad turnips, radishes, and edible flowers. Simple, elegant and tasty enough to be served for a dessert. 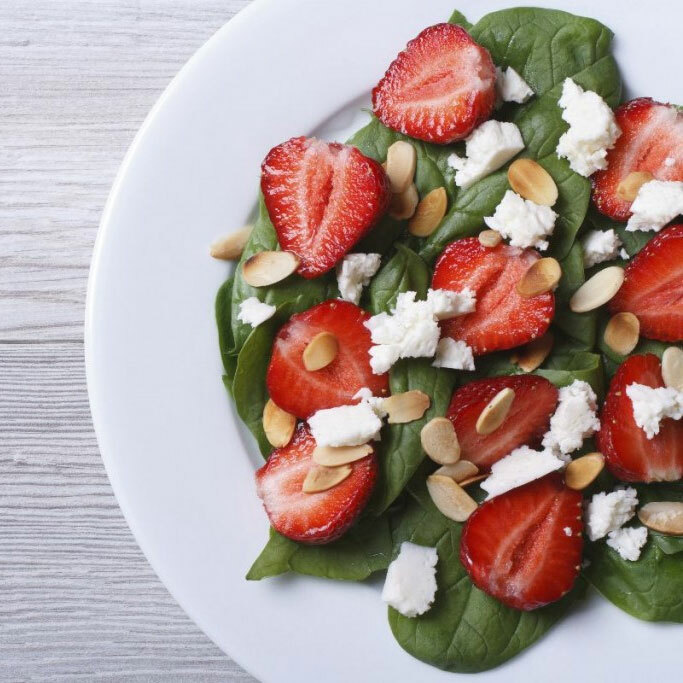 Adapted from a recipe in Eating Well, Summer Strawberry & Feta Salad is a delicious way to enjoy the health benefits of these bright, red berries. To prepare the vinaigrette: Puree 4 strawberries with the scallion in your food processor or blender. Add the garlic or garlic scapes, rice vinegar, olive oil and herbs. Pulse until well combined. Taste the dressing, and add a touch of maple syrup if it is too tart. Season to taste with sea salt and fresh pepper. To prepare the salad: Add the greens and crumbled feta to a bowl. Slice the remaining strawberries and add to the bowl. Toss with the dressing and serve. Nutritional analysis per serving: 118 calories, 4 grams protein, 7 grams carbohydrates, 9 grams fat, 326 mg. sodium, 1 gram fiber.